Although Halloween would be the last day many brides would choose for their wedding day, others love the idea. For some, everything about Halloween – from the crisp, cool weather to the spooky tales and timeless tradition of candy-begging – is magical and beautiful. 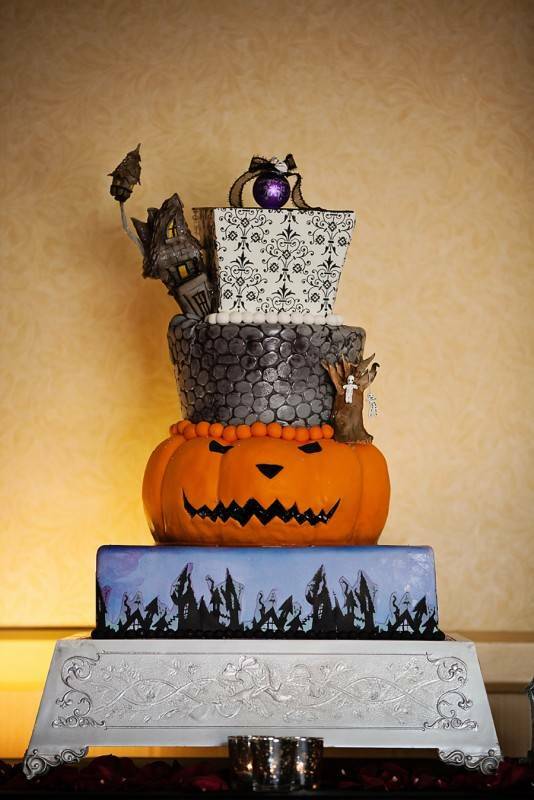 If you’re one of those brides planning a Halloween wedding, check out these unbelievable Halloween cakes! This cake has everything we love most about Halloween; dark silhouettes against a blue night sky, jack o’ lanterns, a creepy haunted house. It’s all put together in this colorful, unbelievably beautiful Halloween cake. 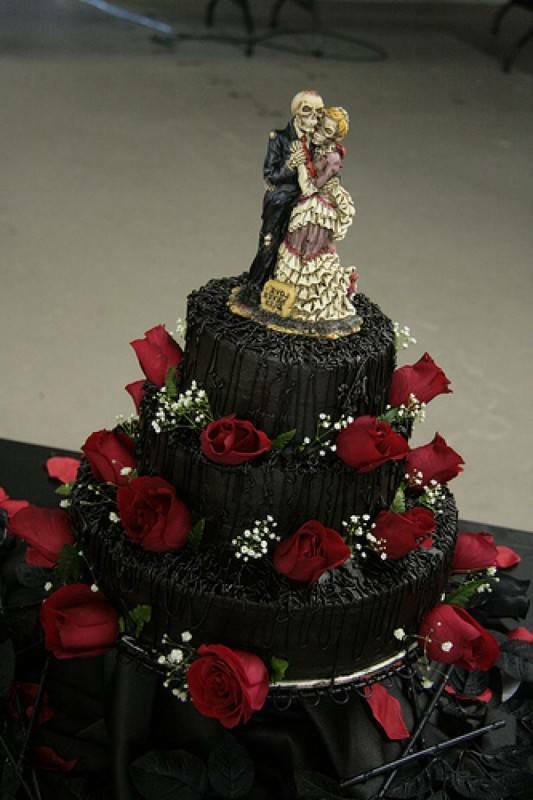 This cake is everything dark and creepy, but simply magnificent. The black tiers are embellished with gorgeous red roses, and the topper is a couple of romantic skeletons ready to say their vows! We just love this one. Haunted mansions; they’re the subjects of creepy books, terrifying movies and even great scary games. 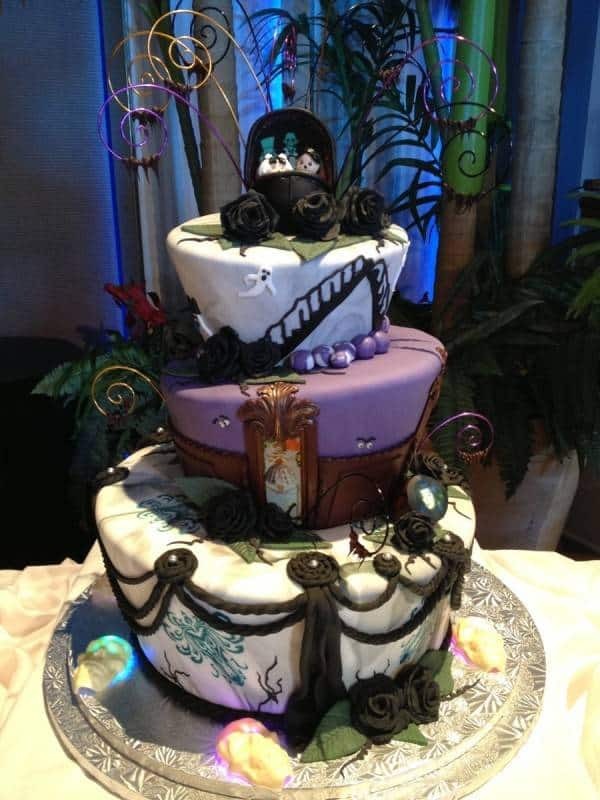 This time, though, a haunted mansion has been captured in a gorgeous wedding cake. It’s complete with chandelier images on the fondant, a haunted doorway, and a special topper! With all the zombie love lately in pop culture, it’s no surprise that there are so many fantastic zombie wedding cakes being ordered. This one is just superb! 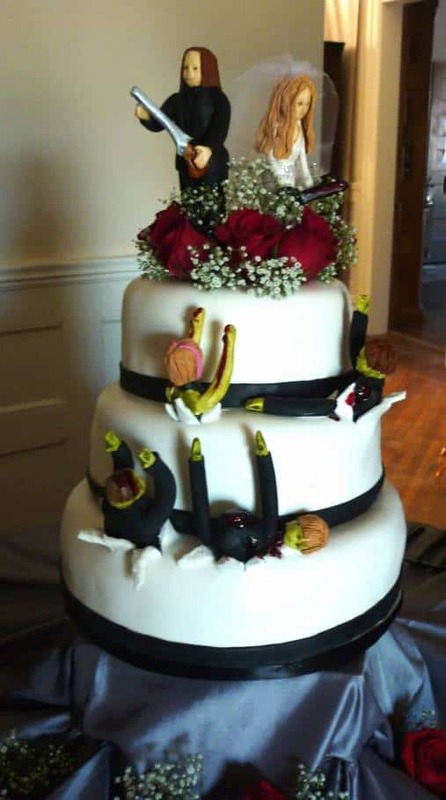 The bride and groom are waiting atop the cake, armed with weapons to fight off the hungry hordes. 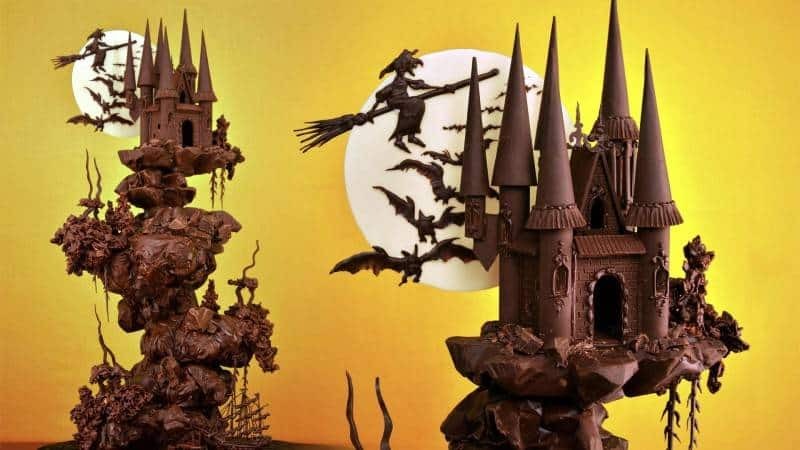 Can you even believe this amazing chocolate castle cake? It’s so realistic, like that witch could fly right at us on her broom! This work of art is the perfect accompaniment to a gorgeous Halloween wedding. The detail is amazing, from the ship sailing near the bluffs to the filigree around the castle windows. Are you a Halloween lover? How would you feel about a spooky Halloween wedding cake? Leave us a comment and tell us which of these amazing cakes is your favorite from the post!